About 10 years ago, I used to think that a Lemon Drop Martini was the height of sophistication when it came to cocktails. I'm not saying there is anything wrong with the cocktail itself. When done well, it can be quite tasty. However, they tend to be heavy laden with sugar and artificial lemon flavor/color. Yuck. 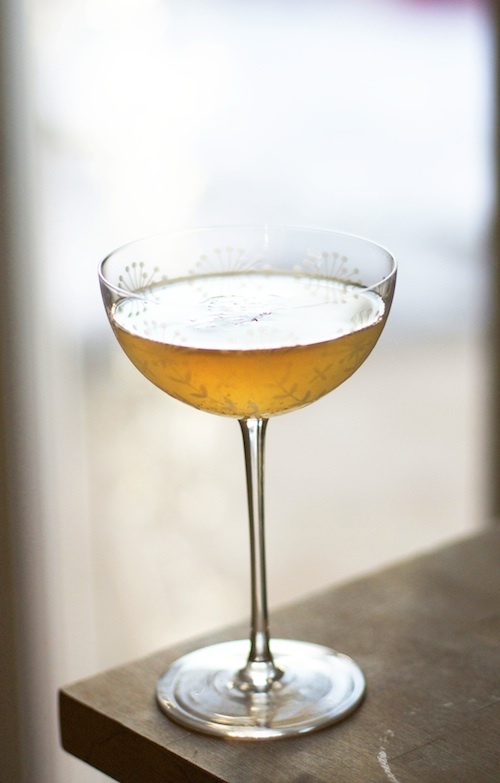 This cocktail, made with Meyer lemons, vanilla, and a flavorful simple syrup is a classier, more complex cocktail that I would be proud to serve to the rest of my grown-up friends. I went the gimlet route, using equal parts gin and a combination of Meyer lemon juice and simple syrup. (A traditional gimlet uses gin or vodka and Rose's lime juice, which is crazy sweet.) Then, on a whim, I added just a touch of vanilla extract. That last addition took this cocktail from good to great and made it perfect to serve as a holiday party aperitif. Citrus cocktails are actually very appropriate for winter. Lemons are in season in these chilly months, so featuring them in recipes this time of year is a must! TGIF everyone. I hope you have a weekend full of fun and love and laughter. And perhaps a Meyer Lemon and Vanilla Gimlet on the side. Combine the gin, lemon juice, simple syrup and vanilla extract in a shaker filled with ice. Shake for about 30 seconds until thoroughly chilled and pour into a cocktail glass. Garnish with a slice of lemon if desired. Combine the zest, water and sugar in a small saucepan and bring to a simmer, stirring until the sugar has dissolved. Let the syrup come to room temperature before using or storing in the refrigerator.